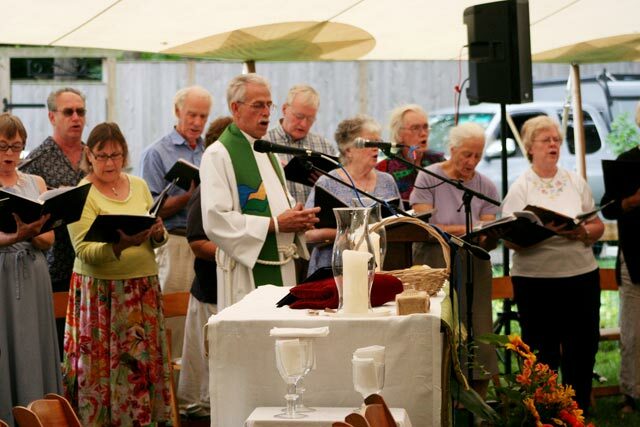 Spirited worship, upbeat hymns, toe-tapping, and hip-swaying jazz, and an old-fashioned church picnic came together under one big tent on the Grace Church rectory lawn in Vineyard Haven Sunday morning. “We have specific needs for the money; we’re not going to fritter it away,” promised John Pearson, campaign co-chair with DiAnn Ray. The $550,000 goal would allow for needed repairs and improvements at the historic church, including restoring the 1883 bell tower, renovating the kitchen, and replacing a damaged wall. A small portion of the proceeds will fund Diocesan programs, many benefiting the Cape and Islands. Thanking donors and campaign helpers, the Rev. Rob Hensley said, “You have responded in an incredible meaningful way.” He also reported that significant leadership pledges had already come in. Parishioners came forward to lay pledge cards on the altar and the service continued with Holy Communion and final prayers. Music was provided by Wes Nagy and his friends Steve Tully, Mike Benjamin, Robbie Soltz, and Boaz Kirschenbaum. Later, the tantalizing aroma of grilling burgers wafted through the air, drawing worshipers to the buffet tables and an easy afternoon of feasting and socializing.